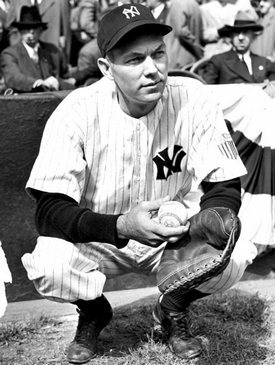 Let’s start this star-studded jersey number with Bill Dickey, because he’s involved with the very origin of the No. 8 as we match it to the number of days until Major League Baseball’s Opening Series in Sydney. In 1929, the Yankees and Indians both planned to regularly wear numbers on their backs in a season for the first time, not as an experiment. The Yankees were rained out on Opening Day, so the Indians were first, and Luke Sewell wore No. 8 on April 7 at home, representing his spot in the Cleveland batting order. The catcher typically batted second to last, before the pitcher. The Yankees opened at home the next day, and Johnny Grabowski had the honor of breaking camp with the No. 8 jersey. They rode a pair of homers from No. 3 hitter Babe Ruth and No. 4 hitter Lou Gehrig in a 7-3 victory over the Red Sox, and Grabowski singled and walked. It was only a matter of days, though, before Dickey, a 22-year-old from Arkansas wearing No. 10, broke into the lineup as catcher and then began putting up numbers that generally kept him there.